You do not need to go and buy every EA there is in order to test them. There are websites that will test and rate some of these systems for you. Are the owners of this website making any money or commission out of the sales? If the answer is "Yes", it may be that they are biased in their evaluation in order to make money out of the sale of that particular robot. Stay away. If the answer is "No", then maybe you can trust the evaluation. Metatrader 5 is a new forex trading platform from the MetaQuotes Corporation. It will replace the Metatrader 4 program that we are currently using for trading. I have tested the Metatrader 5 platform and am impressed with the power of this program. Good News: You will still be able to use Expert Advisors on the new Metatrader 5 platform. Bad News: Expert Advisors that were developed for the older version Metatrader 4 will not be compatible with the programming language of Metatrader 5 and will therefore be useless. All Metatrader 4 Expert Advisors will have to be rewritten in order for them to work on this new version of Metatrader. 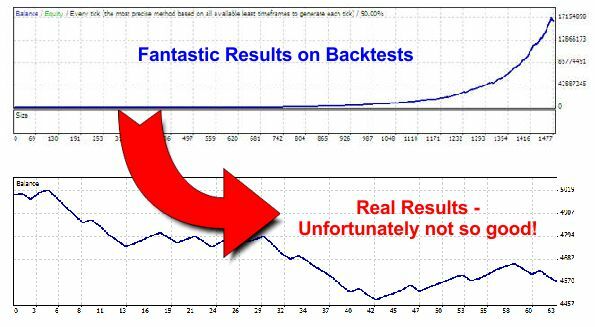 Please be careful when buying Robots because of fantastic looking backtesting results! The developers of the program will optimize the settings to the maximum in order to get the best looking and best performing results possible to use in their advertisements. Unfortunately it is very unlikely that you will get the same kind of results when trading live with this EA. The forex markets are not static but dynamic, and market conditions are changing the whole time. Most EA's are unable to adapt to the constantly changing conditions and therefore cannot get the same kind of results on live trading. that the EA will perform the same in the future! I have decided not to publish the information of any EA here unless the live trading results are available so that we can see that this EA is indeed performing well under live market conditions. The Acceleration EA is indeed performing very well. Please click on the Acceleration EA graph above for more info on this excellent robot.